The Art of Rube Goldberg is the first comprehensive survey exhibition in nearly 50 years that demonstrates the artistic talent and endless imagination of the legendary American cartoonist and illustrator, Rube Goldberg (1883-1970). Celebrated for his graphic techniques, enduring characters, and especially for his invention drawings, Goldberg is an American cultural icon whose influence can still be felt today. The Art of Rube Goldberg brings together more than 75 drawings, rare photographs, sketches, and animated films, as well as rare personal photographs and memorabilia from the Goldberg family archives, to bring to life one of 20th century America’s most wildly talented innovators. From board games and toys to music videos and Hollywood movies, Goldberg has influenced some of the most indelible moments in pop culture. His name is so synonymous with his creations that it was added to the Merriam-Wesbter Dictionary as an adjective that describes the act of complicating a simple task. Enhancing the exhibition is Peter Fischli and David Weiss’ 30-minute video, The Way Things Go (1986–1987), in which objects such as tires, saws, ladders, and buckets are animated by physics: water, fire, gas, and gravity propelled these objects to collide and react in a chain of events. Rube Goldberg’s invention drawings were a major inspiration for Fischli and Weiss during the two years they spent working on the video. 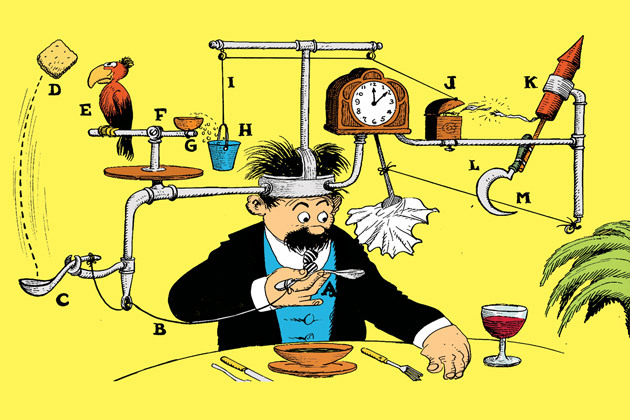 The Art of Rube Goldberg was conceived by Creighton Michael; developed in cooperation with Heirs of Rube Goldberg, LLC, New York, New York; and curated by Max Weintraub. The tour was organized by International Arts & Artists, Washington, DC.